The report on Diet, nutrition, physical activity and breast cancer survivors’ produced by The World Cancer Research Fund (WCRF) presents the latest findings from the Continuous Update Project (CUP). The systematic literature review on diet, nutrition and physical activity included three clinically important outcomes namely all-cause mortality, breast cancer mortality, and second primary breast cancer. Breast cancer recurrence, long-term treatment side effects and quality of life were not included as endpoints. 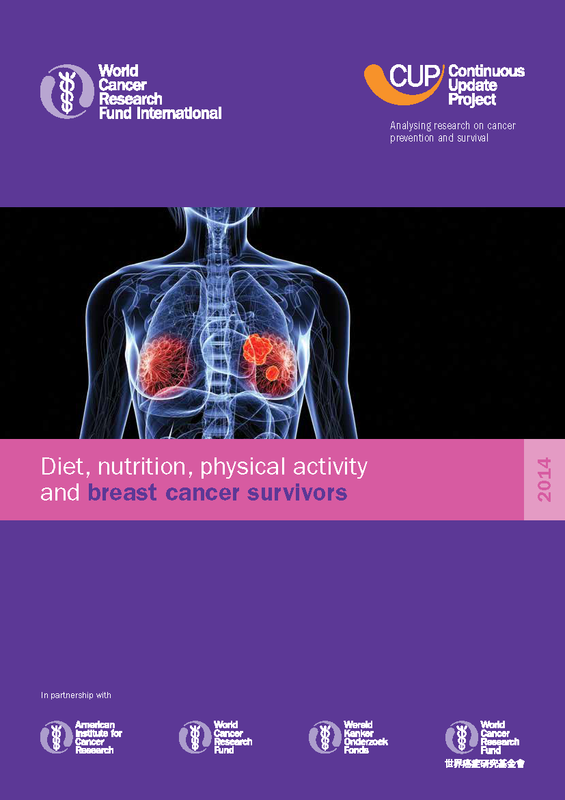 The findings show some limited indications of links between better breast cancer survival and a healthy body weight, being physically active, eating foods containing fibre, eating foods containing soy, and a lower intake of total and saturated fat but these were not strong enough to make recommendations. The conclusions therefore and recommendation for breast cancer survivors is ‘after treatment, to follow the Recommendations for Cancer Prevention’ with a focus on weight management, physical activity and a largely plant based diet. The exposures that have shown some limited evidence are mostly consistent with current recommendations for primary prevention of cancer, diabetes and cardiovascular disease, with the exception of foods containing soya. One particular area of note which the SCPN has been asked about is whether women with breast cancer should take a diet high in soya. The evidence on this is limited, and insufficient to make any recommendation. There is certainly no recommendation about soya supplemented foods. For blog reading (recommended) see (http://blog.wcrf.org/talking-diet-nutrition-physical-activity-breast-cancer-survivors/) written by Anne McTiernan from the CUP Panel.